For a split second you may wonder if you’ve stepped back in time when ambling through the heart of historic Old Louisville in Louisville, Kentucky. Massive Victorian mansions flood the 48 city blocks, obscuring your view of anything but grand estates. Majestic leafy arches frame tree-lined streets, eclipsing the sky and sheltering passersby. The splendor of this neighborhood lures tourists from far ends of the country to see the exciting potpourri of architectural styles and greenery. You’ll find Kentucky recognized in many travel magazines for its homegrown bourbon and Kentucky Derby. But the lesser known Old Louisville is worth seeing for its awe-inspiring appeal. Italianate, Romanesque, and American Craftsman buildings wed a mélange of Renaissance and Queen Anne designs. But the prevailing style is Victorian Gothic. In fact, Old Louisville boasts the largest district of Victorian houses in the nation. A tour of the neighborhood reveals magnolia, dogwood, and oak trees against facades of stained glass windows, turrets, gables, and red sandstone. Listed on the National Register of Historic Places is the St. James-Belgravia District, the neighborhood’s zenith of Victorian elegance. Architecture aficionados will discover Venetian and Colonial beauty intermingling with Chateauesque and Beaux-Arts charm. Take a stroll to the middle of St. James to catch sight of the court’s fountain, the pride and joy of the entire neighborhood. Or book a tour inside the gargoyle-adorned Conrad-Caldwell house to view the Richardsonian-style cherry, maple, and oak woodwork. 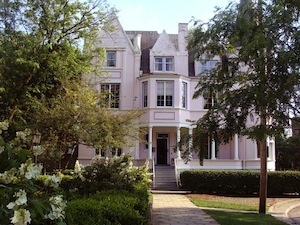 At the opposite end of the Conrad-Caldwell house is the stunning Pink Palace. A former gambling and gentleman’s club, today it attracts visitors for the that give it its lordly spires castle-like ambiance. Gazing up the cerise mansion, you can almost picture Rapunzel letting down her hair. After reaching the Pink Palace, you stumble upon the nearly hidden Belgravia Court, named for its London, England ancestor. What’s truly unique about the court is its flower-dotted walkway. 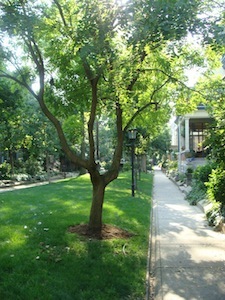 The pedestrian-only street gives Belgravia a private, tranquil feel. Tourists will be surprised by the stillness of this urban paradise where neighborhood cats laze sleepily about, occasionally approaching strangers for companionship. This architectural marvel is the stuff of storybooks with its arched stairways, heavily ornamented doors, and balconies reminiscent of Romeo and Juliet. Whether you’re a garden lover or a history buff or you just welcome places off the beaten path, Old Louisville is sure to delight your senses. You can stop by Central Park during summer evenings to sip wine and watch Shakespeare in the Park plays (502-637-4933) or make a trip to the Filson Historical Society (502-635-5083) to learn more about the neighborhood. Be sure to check out the Old Louisville website (http://www.oldlouisville.org/) for information on events, tours, and festivals like the Annual Garvin Gate Blues Festival, the Victorian Ghost Walk, and the Hidden Treasures Garden Tour.